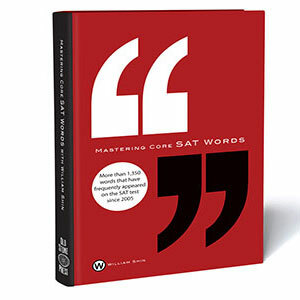 This book contains 1,395 core SAT words along with synonyms, definitions, and example sentences. In addition, in order to help students preparing for the SAT to memorize the words more effectively, certain words have an asterisk(*) which indicates the degree of difficulty. Based on long-term SAT teaching experience, we know that precise memorization of the definitions of the SAT words in this book will enhance students' Critical Reading scores, particularly on the sentence completion and the short reading passage sections. Once students have memorized the words, they will be able to deal more effectively with questions related to the long passages. I have no doubt that this book will give students the tools they need to achieve higher SAT scores. AUTHOR: William H. Shin is a highly credentialed and well respected teacher and mentor to high school students preparing to take their SAT exams. With thorough definitions, synonyms, antonyms, example sentences, and even pronunciations of its 1,395 words, Mastering Core SAT Words by William Shin really helped me to expand my vocabulary. Yes, it is one thing to cram a multitude of words just for the SAT examination, but truly knowing the nuance and the precise implication of these critical words is another. This is an ideal book for those who wish not only to ace the SAT Critical Reading sections but also to enrich their command of the English language.